Lehman Catholic’s Carly Edwards makes a diving catch in center field on Tuesday in Piqua. Lehman Catholic third baseman Grace Brandt fields a ball during a nonconference season opener on Tuesday in Piqua. 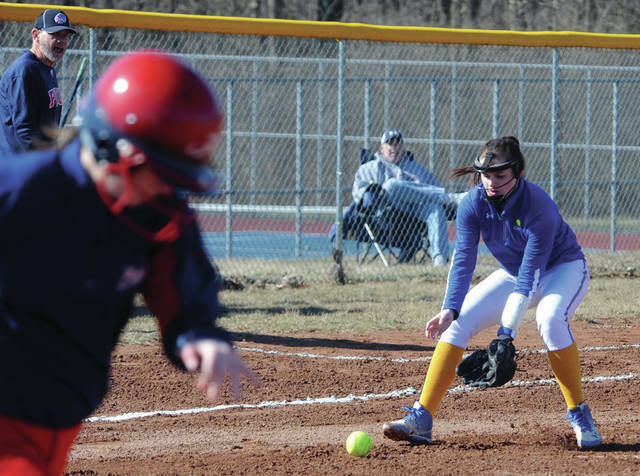 PIQUA — Lehman Catholic’s softball lost 8-1 in its season opener at Piqua on Tuesday. Piqua got off to a fast start, with four runs in the first and second innings. Mariah Blankenship handled things in the circle by pitching a four-hitter with eight strikeouts and no earned runs. Annie Stiver pitched for Lehman, striking out six and walking five. Hope Anthony had a double. The Rockets earned a big win on Tuesday in Spencerville. Eliana Crosson picked up the win for the Rockets in the circle and was 2 for 3 at the plate. Brielle Collier was 3 for 3 with a double, and Gracie Maurer and Taylor Spence were each 2 for 4. Spence had two doubles and Maurer had one. Brandi Weber was 2 for 4 and Olivia Place was 2 for 3. After a stalemate in the first three innings, the Redskins ran away fast and earned a big nonconference win in Fort Loramie on Tuesday. There was no score through the first 3.5 innings but the Redskins scored three in the fourth, one in the fifth and four in the sixth to run away. Desiree’ Fogt was 2 for 3 with 4 RBIs, two of which came on a home run with two outs in the fourth. Aubrey Baker hit a solo home run in the fifth and was 1 for 3. Aleah Frilling and Macy Imwalle were both 2 for 3. Frilling had a triple and Imwalle had a double. Frilling earned the win. She allowed eight hits and had two strikeouts in seven innings. Fort Loramie had nine hits and three errors while Coldwater had one error. The Pirates scored two runs in the fifth to earn a run-rule nonconference win over Botkins on Tuesday in De Graff. Riverside had 15 hits and no errors while Botkins had one hit and four errors. Jalynn Stanley was 3 for 4 for Riverside with 3 RBIs and three runs. She doubled and tripled. Kalin Kreglow was 2 for 3 and Jordyn Marshal was 1 for 3 with 3 RBIs. Stanley picked up the win in the circle. She had seven strikeouts and didn’t allow a walk. Courtney Sutton was charged with the loss for Botkins. She allowed nine earned runs in four innings and had seven strikeouts and three walks. Sutton picked up the team’s only hit. Kenleigh Fortner threw a no hitter to lead the Tigers to a nonconference win on Tuesday in Jackson Center. Fortner was 2 for 4 at the plate with a double. Ashley Mullenhour had a triple and finished with 2 RBIs and Kennedy Jackson and Ally Russo each had a double. The Tigers scored two runs in each the first and the third innings and added one in the fifth. They then scored four in the sixth to put the game away. Jackson Center had 10 hits and six errors while Perry had one error. New Bremen broke open a nonconference game in the fifth inning on Tuesday in Houston and ran away to earn a run-rule victory in six innings. The Cardinals held a 2-1 lead before the fifth but scored nine runs in the inning, in part thanks to a couple of Houston fielding errors. The Wildcats finished with nine hits and seven errors while New Bremen had 11 hits and three errors. Marissa Topp and Hannah Tenkman were both 3 for 4 for New Bremen while Molly Smith and Kira Bertke were each 2 for 2. Bertke and Erin Smith each had 2 RBIs. Tenkman and Kelly Naylor each hit home runs while Topp had a triple and Bertke and Erin Smith both had one double. Molly Smith picked up the win in the circle. She allowed two earned runs in six innings with three strikeouts. Allisen Foster was charged with the loss for Houston. She allowed seven earned runs and had five strikeouts. Foster had three hits while Olivia Bowser and Emilee Foster each had two. 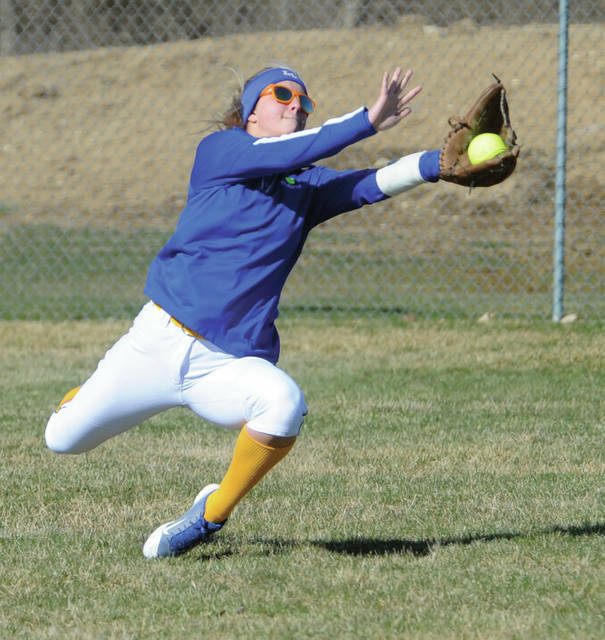 The Wildcats scored six runs in the fifth inning to break open a nonconference game on Tuesday in Celina. Minster had a 2-1 lead before racking up five hits in the fifth, including a three-run home run by Jenna Poeppelman. Poeppelman picked up the win in the circle. She allowed two earned runs on six hits in seven innings and had seven strikeouts with one walk. Laney Hemmelgarn and Taylor Homan were each 2 for 3 for Minster. Homan had 3 RBIs and had a double. The Tigers lost a season opener in five innings on Tuesday at Indian Lake. Versailles had five hits and two errors while the Lakers had 13 hits and no errors. Lauren Monnin allowed eight earned runs in four innings with two strikeouts. Hannah Barga was 2 for 3 for the Tigers and scored the team’s run. Other scores: Fairlawn 16, Waynesfield-Goshen 4. A comeback try by the Raiders fell short in the seventh inning, and Minster held on to earn a victory in a nonconference game on Tuesday in Russia. The Wildcats scored two runs in the second and added one in the fourth, but Russia had two walks to start the seventh inning. Minster pitcher Jack Olberding recovered and forced the next two batters to hit into routine outs. Though the Raiders got one run across on a sacrifice fly, Olberding struck out Daniel Kearns to end the game. The Raiders had four hits and one error while Minster had two hits and one error. Noah Enneking picked up the win for Minster while Olberding earned a save. Enneking allowed two hits and had two strikeouts in four innings while Olberding gave up one hit and had five strikeouts. Evan Monnier was charged with the loss. He allowed three earned runs on two hits and six walks in five innings. He had three strikeouts. Will Sherman was 2 for 4 for the Raiders. The Cardinals picked up a run-rule win in the first game at Houston’s newly renovated baseball complex. They took control by scoring six runs in the first and seven in the second. New Bremen had 18 hits and no errors while Houston had one hit and two errors. Ryan Bertke picked up the win for the Cardinals. He had nine strikeouts in four innings. Luke Foster was charged with the loss for Houston. He gave up nine earned runs on 10 hits and had one walk. Bertke and Mitchell Hays were both 3 for 4 for the Wildcats with 3 RBIs. Justin Tenkman was 4 for 4 with 2 RBIs, Zach Bertke was 2 for 3 with 2 RBIs, Grant Selby was 2 for 3 and Aaron Vonderhaar was 2 for 3. Both Bertkes, Tenkman, and Vonderhaar doubled. Houston’s lone hit was a double by Howie Ludwig. The Rockets lost a nonconference game on Tuesday in St. Henry. St. Henry scored two runs in each the first and third innings to take a 4-2 lead then added four in the fifth to put away the victory. The Redskins had eight hits and four errors while Anna had four hits and five errors. Wil Luthman was 2 for 3 with 1 RBI for the Rockets. He had a double. The Rockets used seven pitchers. Luthman was charged with the loss after allowing four earned runs on three hits. The Trojans earned a nonconference win on Tuesday in De Graff. Jack Liesner pitched a complete game for Botkins, giving up one earned run on two hits. He struck out six and walked only one and didn’t allow a baserunner over the final four innings. The Pirates took a 3-0 lead but Botkins stormed back in the sixth. Tristen Burns, Liesner, and Spencer Heuker all batted in runs to tie the score 3-3. In the seventh inning, Isaac Cisco pinch ran for Ethan Motter following a double by Motter. Cisco advanced to third on a passed ball and then scored on an RBI by Logan Heitkamp. Liesner then retired the final three hitters. Motter led the way offensively with two hits. Anthony Opperman also had one hit. Botkins coach Jason Jones credited third baseman Spencer Heuker for playing a great defensive game. The Cavaliers started the season with a run-rule nonconference win on Tuesday, thanks in part to a no-hitter by Jared Magoteaux. Magoteaux struck out 13 batters in five innings. Drew Barhorst had three hits and scored four runs for the Cavaliers while Seth Roe scored three runs. RJ Bertini and Bryce Kennedy each had 2 RBIs. The Tigers lost a season opener in a nonconference game on Tuesday. It was tied 3-3 after the first inning but the Commodores scored two runs in the second and one in the third to take control. They put the game away with six runs in the seventh. Perry had 12 hits and one error while Jackson Center had 10 hits and five errors. Jacob Vetter was charged with the loss for the Tigers. He allowed two earned runs in two innings on four hits and three walks. Jacob Francis and Aidan Reichert were each 2 for 3 while Carson Regula was 2 for 4. Francis had a double. Reichert led the team with 2 RBIs while Trent Platfoot and Trevor Sosby each scored two runs. Other scores: Cedarville 6, Fairlawn 2. Sidney’s boys squad finished third out of 12 schools while the girls finished sixth out of 10 at Sidney’s Joe Ward Invitational on Tuesday. The Yellow Jackets’ boys finished third with 74 points while Greenville won with 126. Russia and Fairlawn both tied for fourth with 64 points while Lehman Catholic was 10th. Sidney’s Gavin Bockrath was first in the 800 run in 2:09 while Eli Straman was third in 2:18. Bockrath was third in the 1600 run in 4:59. Curtis Spangler was second in the high jump at 5-8. Fairlawn’s Jackson Jones won the 100 dash in 11.33 and Alan Asher won the 400 dash in 53.98. Asher was third in the 200 dash in 24.02 and Jones was first in the high jump at 6-foot-2. Garrett Smail was third in pole vault by clearing 11-0. Russia’s Jason Siefring won the 110 hurdles in 16.81 while Michael York won the shot put with 42-9. The Raiders were second in the 800 relay in 1:43 and third in the 3,200 relay in 9:38. Lehman Catholic’s Brendan O’Leary was first in the 300 hurdles in 43.94 and third in the 110 hurdles in 17.434. Lehman Catholic’s girls squad had the highest finish of local schools at the meet. The Cavaliers were fifth with 75 points. Sidney was sixth with 73, Russia was seventh with 57 and Fairlawn was eighth with 50. Lehman Catholic’s Lauren McFarland won the 100 hurdles in 17.77 while Lindsey Magoteaux won the 100 dash in 12.98. Riley McIver won the 300 hurdles in 50.93. Magoteaux was first in long jump with 15-9. The Cavaliers were first in the 400 relay in 53.55 and second in the 800 relay in 1:55. Sidney’s Zoe Overholser was second in the 100 hurdles in 17.81 and Mariana Kellner was second in the 3200 run in 13:09. Emma Wiford was first in the discus with 105-9 and first in the shot put with 34-5. Russia’s Ella Hoehne was second in the 800 run in 2:37 while Becca Seger was third in the 1,600 run in 5:52. Sophie Francis was second in the high jump at 4-10. Sarah Pinchot was second in pole vault by clearing 9-6 while Kenzie Voisard was third with 7-6. Fairlawn’s Madison Huelskamp was second in the 300 hurdles in 52.90 and was third in the 100 hurdles in 18.05. Fairlawn finished first in the 3,200 relay in 11:35 and third in the 400 relay in 57.31. Fort Loramie’s boys squad finished first in a quad meet at Anna on Tuesday while its girls squad finished second. The Redskins boys were first with 86 points and edged Anna, which finished second with 85.5. Houston was third with 45 and Coldwater was fourth with 39.5. Fort Loramie’s Joe Ballas finished first in the 1,600 run in 4:54.2 and just edged teammate Jake Rethman, who was second in 4:54.8. Gavin Schulze was first in the 400 in 56.2 and Ballas was first in the 800 in 2:13.9. Rethman was first in the 3,200 run in 10:56. Collin Detrick won the discus with 146-10 and Charles Wray won the long jump with 17-9. Connor Raterman won the shot put with 45-6. Anna won the 800 relay in 1:36 and the 400 relay in 46.49. Alex Bruggaman won the 110 hurdles in 16.47 while Ian Bollheimer won the 100 dash in 11.77. Colton Nanik was first in the 300 hurdles in 44.4 and Derek Arling was first in the 200 dash in 24.75. Houston won the 3,200 relay in 8:58 and the 1,600 in 3:46. Wesley Jester won the high jump with 5-8. Fort Loramie’s girls squad was second with 69 points while Coldwater finished first with 92. Anna was third with 62 and Houston was fourth with 33. Fort Loramie won the 3,200 relay in 10:46 and the 800 relay in 1:54. Kennedi Gephart finished first in the 100 dash in 13.25 and Chloe Stang was first in the 400 run in 1:08. Abby Wrasman was first in the high jump with 5-0. Hannah Shoemaker won the 100 hurdles in 16.9 and the 300 hurdles in 47.99. Houston’s Hollie Voisard finished first in the 1,600 run in 6:01.6 and just beat teammate Ava Knouff, who was second with 6:01.9. Shelby Ayers won the discus with 111-4. The Cavaliers lost a road match on Tuesday. In singles, Danny Lins lost 6-0, 6-2; Sam Gilardi lost 3-6, 6-2, 6-3; and Max Schmiesing lost 6-1, 6-0.